Inflammatory responses to the human pneumovirus pathogen, respiratory syncytial virus (RSV), can be strong and persistent, beyond the control of conventional antiviral and anti-inflammatory therapies, resulting in profound negative consequences for the host (reviewed in Ref. 1). Pneumonia virus of mice (PVM), a rodent pneumovirus pathogen closely related to RSV, serves as a model of severe respiratory virus infection and is an important platform for exploring immunomodulatory therapy and disease prevention (2, 3). No single mouse model can reproduce all features of human disease or represent the full spectrum of human experience; however, unlike RSV challenge–clearance models in mice, PVM undergoes robust replication in mouse lung tissue, elicits disease-relevant outcomes, and fulfills Koch’s postulates for a host/pathogen relationship in rodent species. In previous work, we described important immunomodulatory properties of Gram-positive Lactobacillus species at the respiratory mucosa (4, 5). Specifically, we found that priming of the respiratory tract of wild-type mice with Lactobacillus plantarum or Lactobacillus reuteri promoted both profound and sustained protection against an otherwise lethal PVM infection. These observations represent a robust example of heterologous immunity, also known as innate imprinting, or trained immunity, concepts that have been invoked to explain increased resistance (or in some cases, susceptibility) to an unrelated infection observed upon recovery from a primary innate immune or inflammatory response (6–9). There are numerous examples of these observations in the literature. Among them, several groups have reported that mice vaccinated against tuberculosis with bacillus Calmette–Guérin (BCG) were protected against infections with antigenically unrelated pathogens, including Gram-positive bacteria, the fungus Candida albicans, and the parasite Schistosoma mansoni (reviewed in Ref. 6); analgous findings have been reported in BCG-vaccinated children (10). Heterologous immunity has also been invoked to explain the increased susceptibility to infection with Streptococcus pneumoniae observed among patients recovering from severe influenza infection (reviewed in Ref. 11). In an effort to elucidate the mechanisms underlying heterologous immunity to lethal respiratory virus infection, we have evaluated the molecular and cellular inflammatory responses generated in situ in lung tissue of Lactobacillus-primed mice. Among these findings, mice primed with Lactobacillus and subsequently challenged with PVM respond with moderate suppression of virus recovery together with diminished expression of an array of proinflammatory cytokines (4). Interestingly, Harmsen and colleagues (12, 13) recently reported that protein cage nanoparticles, multisubunit immunostimulatory molecules derived from the small heat shock protein of the thermophilic bacteria Methanocaldococcus jannaschii, promote B cell–dependent heterologous immunity in mice against a wide variety of respiratory virus pathogens, including PVM. Specifically, protein cage nanoparticles induced accelerated adaptive immunity to virus pathogens (13) in association with the formation of BALT, a tertiary lymphoid structure induced in response to microbial and/or inflammatory provocation that features germinal center B cells, follicular dendritic cells, and T cells (14–17). In our earlier work, we found that Lactobacillus-mediated priming of the mouse respiratory tract also resulted in the induction of peribronchiolar and perivascular cuff-like infiltrates, consistent with histological descriptions of BALT (4). With this information, together with the larger understanding of B cells as immunomodulatory and antiviral mediators, including production of natural IgM (18), Ab-independent support of macrophages (19), and production of the anti-inflammatory cytokine IL-10 (20), our goal was to determine whether B cells played a crucial role in Lactobacillus priming and protection elicited against lethal respiratory virus infection. Wild-type C57BL/6 and BALB/c mice were purchased from the Division of Cancer Therapeutics, National Cancer Institute (Frederick, MD). B cell–deficient mouse strains used include μMT mice (The Jackson Laboratory, stock 2288; C57BL/6 background) (21) and Jh mice (Taconic; BALB/c background) (22). All mouse studies were approved by National Institute of Allergy and Infectious Diseases and carried out in accordance with National Institute of Allergy and Infectious Diseases Institutional Animal Care and Use Committee Guidelines. Cultures of L. plantarum NCIMB 8826 (ATCC BAA-793) were grown overnight in MRS broth at 37°C in a shaker incubator. Bacteria were washed in sterile PBS and resuspended at 2 × 1010 CFU/ml (4) in sterile PBS with 0.1% BSA for intranasal inoculation under isoflurane anesthesia. Each mouse received 50 μl of this dilution or 50 μl PBS with 0.1% BSA diluent control per inoculation, which reaches both upper and lower respiratory tracts (23) at days −14 and −7 of the protocol (see timeline in Fig. 1A). For the experiment involving heat-inactivated L. plantarum, live cultures grown and washed as above were resuspended in a minimal volume of PBS, heated to 95°C for 10 min in a thermocycler, and then frozen in a dry ice/ethanol bath; this was repeated for a total of three cycles. Heat-inactivated bacteria were then resuspended in PBS with 0.1% BSA at 1011 CFU/ml (determined as per original live titration) (4) and stored at −80°C prior to use at appropriate dilution. For experiments in which mice were provided with L. plantarum in drinking water, bacteria were grown overnight as above, washed, and resuspended at 109 live CFU/ml in standard drinking water (250/ml/cage). Mice were provided with fresh drinking water (with freshly cultured live bacteria) every 3 d for 2 wk prior to PVM inoculation and for the remaining period thereafter. Mice were weighed every 3 d prior to PVM inoculation to ascertain appropriate water intake throughout. Fifty percent tissue culture-infective dose assays (24) provided quantitative evaluation of mouse-passaged PVM J3666 stocks. Infections were established in isoflurane-anesthetized mice via intranasal inoculation with 0.2– 2 fifty percent tissue culture-infective dose units in 50 μl DMEM diluent. Virus recovery was determined from cDNA generated from total RNA from mouse lung tissue via a dual standard curve quantitative RT-PCR method targeting the PVM SH gene and mouse GAPDH that generates absolute copy numbers per copy GAPDH (PVMSH/GAPDH) as previously described (4). Cytokine ELISAs (R&D Systems, Minneapolis, MN) were performed on clarified homogenates of lung tissue and corrected for total protein by BCA assay. Ig ELISAs (Kamiya Biomedicals, Seattle, WA) were performed on bronchoalveolar lavage fluids. All kits were used as per manufacturers’ instructions. Lung tissue was harvested and single-cell suspensions were prepared as previously described (4, 5). Live/Dead stain (Invitrogen) was added to the cells and Ab binding to Fc receptors was blocked with anti-mouse CD16/CD32. Cells were then stained with anti–CD3-FITC, anti–CD19-V450, and anti–GR1-allophycocyanin in PBS with 0.1% BSA at 4°C for 1 h and washed with this buffer prior to analysis. All Abs were purchased from BD Biosciences (Durham, NC). A minimum of 100,000 events were collected on an LSR II flow cytometer (BD Biosciences) and findings were analyzed in FlowJo 9.2. Cell numbers were calculated from the percentage live CD3+CD19− (T cells) and percentage live CD3−CD19+ (B cells) within the lymphocyte gate (low forward/low side scatter), corrected for the fraction of total cells that were analyzed from each single-cell suspension. Tissue sections prepared from 10% phosphate-buffered formalin-fixed lung tissue were stained with H&E. Unstained sections were probed with purified rabbit polyclonal anti-RGS13 Ab (25), rat anti-mouse B220 mAb (mAb1217; R&D Systems) or appropriate control Abs followed by peroxidase-conjugated anti-Ig and developing reagents (Histoserv, Germantown, MD). Data were analyzed using Mann–Whitney U test and one-way ANOVA as appropriate. As reported in our previous publications (4, 5), BALB/c mice primed via intranasal inoculation with live L. plantarum (109 CFU/mouse on days −14 and −7) are fully protected against the lethal sequelae of a subsequent PVM infection (Fig. 1A). Lactobacillus-mediated protection is associated with diminished virus recovery from lung tissue (Fig. 1B), although we have shown previously that virus recovery is not a strong predictor of the degree of protection elicited by Lactobacillus priming (4, 5). Heat-inactivated Lactobacillus is also protective against the lethal sequelae of acute PVM infection (4). In this study, we show that heat-inactivated L. plantarum can protect against the lethal sequelae of infection even when PVM inoculation is delayed for 4 wk, from day 0 to day 28. As shown in Fig. 1C, mice primed with vehicle control rapidly lose weight in response to PVM infection and ultimately succumb to infection. In contrast, mice primed with L. plantarum (108 CFU/mouse on days −14 and −7) do not lose weight and survive long-term thereafter. In contrast to our findings with direct mucosal priming, we observed no protection against the lethal sequelae of PVM infection among mice receiving L. plantarum in drinking water (109 CFU/ml for 2 wk prior to PVM inoculation on day 0; Fig. 1D). Priming of the respiratory tract of wild-type mice with live L. plantarum results in protection against subsequent lethal pneumovirus infection. (A) BALB/c mice inoculated intranasally with 109 CFU L. plantarum on days −14 and −7 are fully protected from an otherwise lethal infection with PVM; n = 10 mice/group. ***p < 0.001. (B) Virus recovery from lung tissue at day 5 after inoculation with PVM from mice primed with L. plantarum or PBS/BSA as in (A); n = 6 mice/group. *p < 0.05. (C) BALB/c mice inoculated intranasally with 108 CFU heat-inactivated L. plantarum on days −14 and −7 are fully protected from a lethal infection with PVM, inoculation on day +28; shown are weights (g ± SD) at day −14 and days 28–40 (n = 5 mice/group) and at days 34 and 35 (n = 3 and 2 mice/group), respectively, in the group inoculated with PBS + 0.1% BSA, owing to lethal outcomes. (D) Mice received 109 CFU L. plantarum/ml drinking water for 2 wk prior to inoculation with PVM on day 0; n = 15 mice/group. Lung tissues from L. plantarum–primed mice feature dense mononuclear cell infiltrates at the airways and blood vessels (Fig. 2A–C), consistent with descriptions of BALT (14). The infiltrates are enriched with B cells (B220+; Fig. 2D) and also can also be detected with RGS13, a marker for germinal center B cells (Fig. 2E, 2F). Likewise, elevated levels of total IgG (Fig. 3A), IgA (Fig. 3B), and IgM (Fig. 3B) were detected in the airways of L. plantarum–primed mice. Formation of B cell–enriched infiltrates in lung tissue in response to L. plantarum priming. (A) H&E-stained lung tissue from mouse primed once only (day −14) with 109 PFU L. plantarum. Original magnification ×10. (B) H&E-stained lung tissue from mouse primed twice (days −14 and −7) each with 109 PFU L. plantarum. Original magnification ×10. (C) Area within box in (B) featuring dense mononuclear cell infiltrate. Original magnification ×20. (D) Area within box in (B) and (C), probed with monoclonal rat monoclonal anti-mouse B220. (E) H&E-stained lung tissue from L. plantarum–primed (days −14 and day −7), PVM-infected (day 0) mouse. Original magnification ×10. (F) Area within box in (E) probed with rabbit polyclonal anti-RGS13, a marker for germinal center B cells (25). Elevated levels of Igs in the airways of L. plantarum–primed mice. (A) Total IgG, (B) total IgM, and (C) total IgA detected by ELISA in bronchoalveolar lavage fluid from mice primed twice (on days −14 and −7; see Fig. 1A) with L. plantarum compared with mice primed with twice with PBS/BSA diluent control. *p < 0.05, ***p < 0.001. To explore the possibility that B cells play a role in heterologous immunity promoted by Lactobacillus priming, we examined the results of L. plantarum priming and PVM infection two B cell–deficient mouse strains, including μMT (C57BL/6 background) in which targeting of the Cμ locus results in arrested development at the pre–B cell stage (21) and Jh (BALB/c background) in which a similar phenotype results from the deletion of four JH segments from the H chain locus (22). As anticipated, no B cells (CD3−CD19+) were detected in lung cell suspensions from either control or L. plantarum–primed, PVM-infected mice μMT mice (Fig. 4A, 4B); T cell recruitment (CD3+CD19−) persisted despite the B cell deficiency (Fig. 4C). Similarly, no B cells were detected in lung tissue from L. plantarum–primed, PVM-infected B cell–deficient Jh mice (Fig. 4D–F). Flow cytometric detection of lymphocytes in lungs of L. plantarum–primed, PVM-infected wild-type and B cell–deficient mice. (A) Total (B) B (CD3−CD19+) cells and (C) T (CD3+CD19−) cells in single-cell suspensions of lungs of L. plantarum or control-primed (days −14 and −7), PVM-infected wild-type (C57BL/6), and B cell–deficient (μMT) mice; n = 3 mice/group. *p < 0.05, **p < 0.01. (D) Total (E) B (CD3−CD19+) and (F) T (CD3+CD19−) cells in L. plantarum–primed, PVM-infected wild-type BALB/c and B cell–deficient Jh mice; n = 4 mice/group. *p < 0.05. Total B and T cells determined from percentage of total lymphocytes of live cells with forward scatterlow/side scatterlow. Similar to what we observed in BALB/c mice, C57BL/6 mice also respond to Lactobacillus priming and PVM infection by developing prominent infiltrates (Fig. 5A) enriched with (B220+) B cells (Fig. 5B). 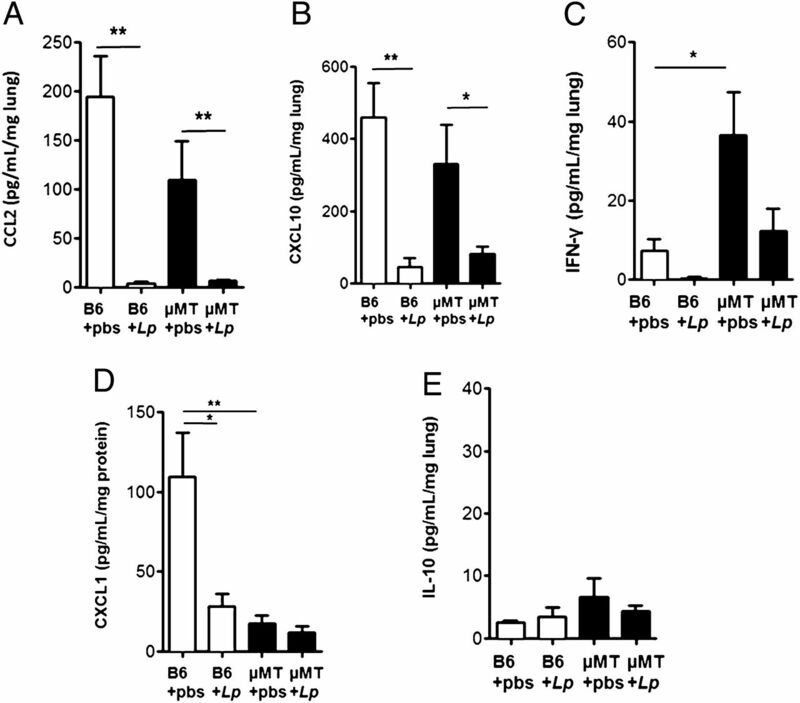 No infiltrates are detected in L. plantarum–primed, PVM-infected B cell–deficient μMT mice (Fig. 5C, 5D). Likewise, analogous to what we observed in L. plantarum–primed BALB/c mice (Fig. 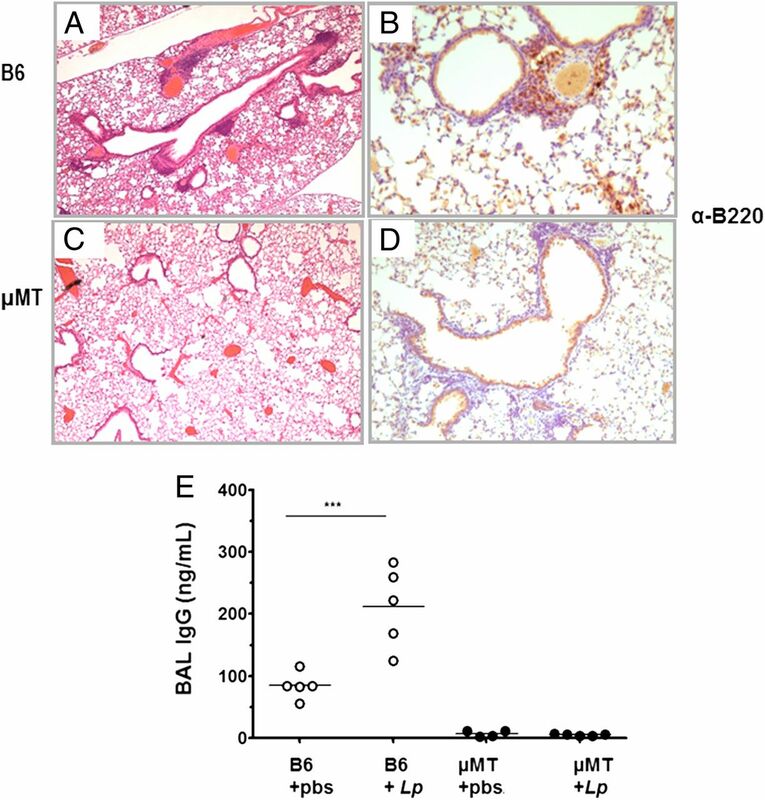 3A), elevated levels of total IgG were detected in the airways of L. plantarum–primed C57BL/6 mice; no IgG was detected in the airways of B cell–deficient μMT mice (Fig. 5E). Similar results were obtained for total IgM and IgA (data not shown). 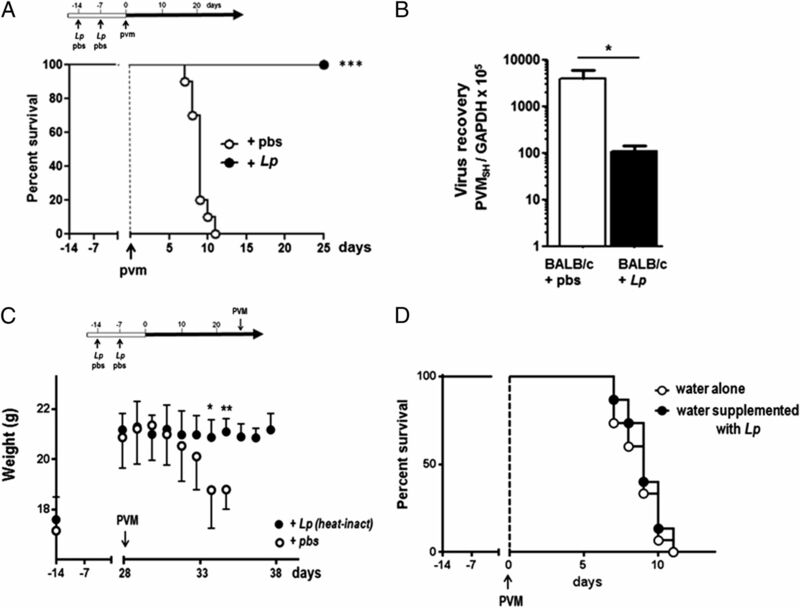 No infiltrates in lung tissue of Lactobacillus-primed, PVM-infected B cell–deficient μMT mice. (A) H&E-stained lung tissue from L. plantarum–primed, PVM-infected wild-type C57BL/6. Original magnification ×10. (B) Lung tissue in (A), probed with rat monoclonal anti-mouse B220. Original magnification ×40. (C) H&E-stained lung tissue from L. plantarum–primed, PVM-infected B cell–deficient μMT mice. Original magnification ×10. (D) Lung tissue from L. plantarum–primed, PVM-infected μMT mice probed with rat monoclonal anti-mouse B220. (E) Total IgG detected in bronchoalveolar lavage fluid from L. plantarum–primed (days −14 and −7) C57BL/6 wild-type mice and B cell–deficient μMT mice (day +3). ***p < 0.001. We observed no statistically significant differences in virus recovery when comparing wild-type and B cell–deficient (μMT) mice; Lactobacillus priming resulted in 0.5–0.8 log reductions in virus recovery in both wild-type and B cell–deficient strains (Fig. 6A). Similarly, as shown in Fig. 6B, B cell deficiency has no impact on Lactobacillus-promoted survival from an otherwise lethal respiratory virus infection. All control (PBS/BSA) primed PVM-infected mice died between days 7 and 11, and all L. plantarum–primed PVM-infected mice survived throughout (p < 0.001). 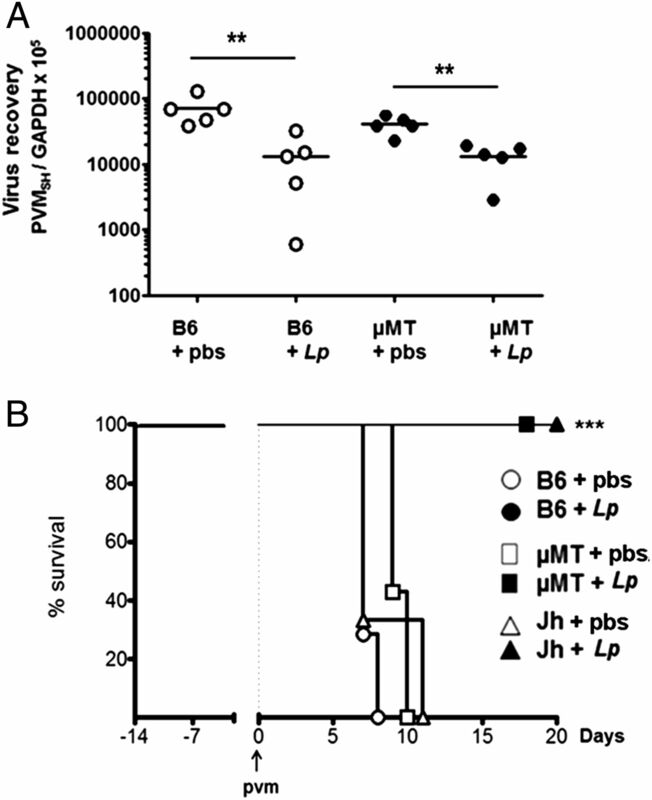 Virus recovery and survival of Lactobacillus-primed, PVM-infected wild-type and B cell–deficient μMT and Jh mice. (A) Virus recovery (day +7) from lung tissue of L. plantarum–primed, PVM-infected wild-type C57BL/6 and μMT mice. **p < 0.01. (B) Survival of L. plantarum–primed, PVM-infected wild-type C57BL/6 (n = 14, 7 per condition), μMT (n = 14, 7 per condition), and Jh mice (n = 6, 3 per condition). ***p < 0.001; filled circle is superimposed over filled square. 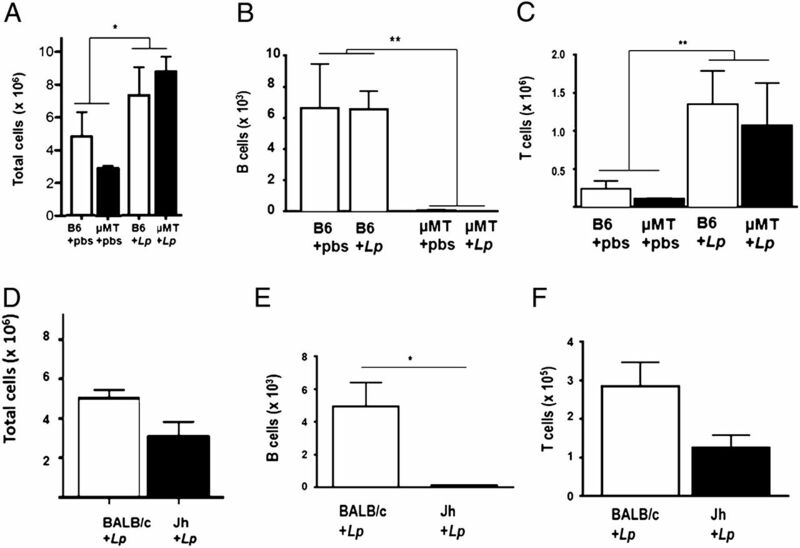 Survival of wild-type L. plantarum– and control-primed BALB/c mice is shown in Fig. 1A. Although virus recovery and survival responses of B cell–deficient mice are indistinguishable from those of their wild-type counterparts, patterns of cytokine suppression are not fully superimposable. Specifically, L. plantarum priming prior to virus infection results in profound suppression of both CCL2 (Fig. 7A) and CXCL10 (Fig. 7B) in both wild-type and μMT mice. Suppression of IFN-γ is also observed in both strains, although significantly more of this cytokine is produced in response to PVM infection in B cell–deficient mice (Fig. 7C); we have shown previously that IFN-γ is not a crucial mediator of L. plantarum–mediated protection against PVM infection (5). In contrast, CXCL1, which undergoes substantial suppression in Lactobacillus-primed, PVM-infected mice, is not a major feature of the response to PVM infection in the μMT strain (Fig. 7D). Finally, IL-10, a prominent anti-inflammatory cytokine produced by regulatory B cells (20) as well as by monocytes, is not detected in response to Lactobacillus priming in wild-type or B cell–deficient μMT mice (Fig. 7E). Local cytokine production in Lactobacillus-primed, PVM-infected wild-type C57BL/6 mice and B cell–deficient μMT mice. (A) CCL2, (B) CXCL10, (C) IFN-γ, (D) CXCL1, and (E) IL-10; n = 5 mice/bar. *p < 0.05, **p < 0.01. From these studies, we conclude that B cells are dispensable for Lactobacillus-mediated heterologous immunity and have no role in promoting survival in response to an otherwise lethal respiratory virus infection. As noted earlier, heterologous immunity, also known in other contexts as innate imprinting, and trained immunity (6–9) are concepts that explain increased (or decreased) resistance to unrelated infections that result from primary innate immune or inflammatory response. Netea et al. (7) introduced the term “trained immunity” as a means to explain and to explore nonspecific cross-protection to unrelated microbes. Among these findings, as noted earlier, were observations documenting systemic exposure to attenuated Mycobacterium tuberculosis (BCG vaccination) that resulted in nonspecific systemic immunity to several unrelated pathogens (reviewed in Ref. 6). BCG-mediated macrophage activation and antimicrobial peroxide production was initially implicated in this mechanism (26). Kleinnijenhuis et al. (27) recently reported that nonspecific protection elicited by BCG vaccination in human subjects was directly dependent on persistent, NOD2-dependent epigenetic alterations in circulating monocytes, specifically altered histone methylation patterns, and that BCG vaccination likewise elicited induction of proinflammatory cytokines IFN-γ, TNF-α, and IL-1β. Lactobacillus priming of the respiratory mucosa and protection generated against PVM infection is another dramatic example of this concept, as we observe not only robust but ongoing and sustained protection against an unrelated respiratory virus pathogen (4, 5). Specifically, we have shown that significant protection against a lethal inoculum of PVM can be sustained for 5 mo or longer after only two intranasal inoculations of L. plantarum. Interestingly, as we compare our findings to the aforementioned results of Kleinnijenhuis et al. (27), we find that Lactobacillus priming of the respiratory mucosa is similarly associated with induction of proinflammatory cytokines IFN-γ and TNF-α, although we found in our earlier work that IFN-γ was dispensable for heterologous immunity (i.e., survival in response to subsequent PVM challenge) (5). Interestingly, and in contrast to findings with BCG vaccination (27), preliminary results from our laboratory indicate that heterologous immunity elicited in response to Lactobacillus priming of the respiratory mucosa is not directly dependent on the presence of the pattern recognition receptor NOD2 (H.F. Rosenberg, unpublished results). There are several intriguing examples of heterologous immunity elicited by microbial agents via direct priming at the respiratory mucosa that likewise appear to proceed via distinct mechanisms. For example, Clement, Tuvim, Evans, and colleagues (28–31) have examined immunity generated in mice subjected to multiple instillations of a sterile lysate from the Gram-negative microorganism nontypeable Haemophilus influenza (NTHi). Similar to our findings, they have reported that intranasal NTHi results in protection from the lethal sequelae of influenza A infection. However, in contrast to immunity elicited by Lactobacillus priming against PVM (4, 5), protection elicited by the NTHi infusions is short-lived, results in a prominent type I IFN response, and is dependent on epithelial cell-specific MyD88 signaling. Thus, although direct priming with either NTHi or Lactobacillus serves to promote protection against acute respiratory virus infection, the cellular and biochemical mechanisms promoting these responses are clearly distinct and stimulus-specific. Likewise, several groups have shown that intranasal administration of Lactobacillus species, using a variety of priming strategies, also protects mice against acute influenza infection (32, 33), similar to our findings with PVM (4, 5). Interestingly, oral administration of at least three distinct Lactobacillus strains has also been reported as effective against the lethal sequelae of influenza (34–36). These results are significantly at odds with our findings with PVM, in which we document that prolonged oral administration of L. plantarum has no impact whatsoever on survival (Fig. 1C). It would be intriguing to determine the source of these different results and what the underlying mechanisms might be. In this study, we focused on a role for B cells in promoting heterologous immunity. Apart from their role in adaptive immunity, specific B cell subsets have also been implicated in antiviral host defense. For example, Choi and Baumgarth (37) and Jayasekera et al. (38) demonstrated that B1a cells play important roles in innate immunity to influenza infection by production of virus-neutralizing nonspecific IgM. Similarly, as reported by Moseman et al. (19), B cell–derived lymphotoxin α1β2 was necessary to support subcapsular sinus macrophages within draining lymph nodes, thus preventing fatal infection with vesicular stomatitis virus. B cells are also among the crucial components of BALT, which are tertiary lymphoid structures that develop in mouse lung tissue in response to inflammatory and/or microbial provocation (14–17). Classic BALT has a structured organization with distinct T and B cell areas, with the latter including follicular dendritic cells and proliferative germinal centers, although variants with primarily B cells (39) or intermixed zones (14) have been described. We have shown in the present study that the lymphoid clusters induced by L. plantarum include both B220-positive mature B cells as well as RGS13-positive cells, shown by Shi et al. (40) to be a specific marker for germinal center B cells. As noted earlier, Harmsen and colleagues (12, 13) found that otherwise unmanipulated mice primed with protein cage nanoparticles, multisubunit particles derived from bacterial heat-shock proteins, developed BALT; furthermore, they reported that B cell–mediated immunomodulatory mechanisms, including accelerated generation of Igs in situ, were crucial to bacterial/protein-mediated protection against respiratory virus pathogens. Interestingly, we find that although Lactobacillus priming induces the formation of B cell–enriched infiltrates with germinal centers, Lactobacillus-mediated protection proceeds via mechanisms that are B cell independent. In contrast to results obtained with protein cage nanoparticle priming and influenza (12), in which diminished virus recovery was B cell dependent, we determined that virus recovery after PVM infection is diminished in both L. plantarum–primed B cell–deficient and wild-type strains. Furthermore, survival of Lactobacillus-primed, PVM infected B cell–deficient mice was indistinguishable from that of their wild-type counterparts. It is again intriguing to find that such fundamentally different mechanisms promote what are otherwise similar outcomes. In summary, we have shown that mice primed via intranasal inoculation with L. plantarum are protected against subsequent PVM infection. We show in the present study that L. plantarum priming elicits formation infiltrates enriched with B lymphocytes and elevated levels of Igs in the airways. Although B cells have been implicated in promoting heterologous immunity against PVM and other respiratory virus infections (12), L. plantarum–primed, PVM-infected B cell–deficient mice respond with diminished virus recovery, indistinguishable from their wild-type counterparts. Furthermore, L. plantarum–primed, B cell–deficient mice are fully protected from the lethal sequelae of PVM infection. We conclude that B cell deficiency has no impact on these important outcomes underlying heterologous immunity promoted uniquely via Lactobacillus priming at the respiratory mucosa. H.F.R. is engaged in a Collaborative Research and Development Agreement pertaining to aspects of this work with GlaxoSmithKline. The remaining authors have no financial conflicts of interest. We thank Dr. Kirk Druey (National Institute of Allergy and Infectious Diseases/National Institutes of Health) for the rabbit polyclonal anti-RGS13 Ab, Dr. Kirk Druey and Jesse D. Keicher (Investigator, Infectious Diseases, GlaxoSmithKline) for helpful discussions regarding the manuscript, Dr. Sandra Hayes (State University of New York, Syracuse, NY) for helpful discussions on B cell development and identifying the Jh gene–deleted mouse model, and Dr. Alfonso Gozalo and the staff of the 14BS animal facility (National Institute of Allergy and Infectious Diseases/National Institutes of Health) for care of the mice used in these experiments.
. 2012. Inflammatory responses to respiratory syncytial virus (RSV) infection and the development of immunomodulatory therapeutics. Curr. Med. Chem. 19: 1424–1431.
. 2008. Pneumonia virus of mice: severe respiratory infection in a natural host. Immunol. Lett. 118: 6–12.
. 2011. Animal models of respiratory syncytial virus disease. Am. J. Physiol. Lung Cell. Mol. Physiol. 301: L148–L156.
. 2011. Lactobacillus-mediated priming of the respiratory mucosa protects against lethal pneumovirus infection. J. Immunol. 186: 1151–1161.
. 2013. Lactobacillus priming of the respiratory tract: heterologous immunity and protection against lethal pneumovirus infection. Antiviral Res. 97: 270–279.
. 2014. Innate immune memory: implications for development of pediatric immunomodulatory agents and adjuvanted vaccines. Pediatr. Res. 75: 184–188.
. 2007. The impact of successive infections on the lung microenvironment. Immunology 122: 457–465.
. 2013. Macrophage activation and polarization as an adaptive component of innate immunity. Adv. Immunol. 120: 163–184.
. 2003. BCG scar and positive tuberculin reaction associated with reduced child mortality in West Africa. A non-specific beneficial effect of BCG? Vaccine 21: 2782–2790.
. 2009. Inducible bronchus-associated lymphoid tissue elicited by a protein cage nanoparticle enhances protection in mice against diverse respiratory viruses. PLoS ONE 4: e7142.
. 2012. A virus-like particle vaccine platform elicits heightened and hastened local lung mucosal antibody production after a single dose. Vaccine 30: 3653–3665. 2010. Bronchus-associated lymphoid tissue (BALT): structure and function. Adv. Immunol. 107: 187–241.
. 2005. Bronchus and nasal-associated lymphoid tissues. Immunol. Rev. 206: 22–31.
. 2004. Role of inducible bronchus associated lymphoid tissue (iBALT) in respiratory immunity. Nat. Med. 10: 927–934.
. 2010. The importance of natural IgM: scavenger, protector and regulator. Nat. Rev. Immunol. 10: 778–786.
. 2012. B cell maintenance of subcapsular sinus macrophages protects against a fatal viral infection independent of adaptive immunity. Immunity 36: 415–426.
. 2002. Distribution of intranasal instillations in mice: effects of volume, time, body position and anesthesia. Am. J. Physiol. Lung Cell. Mol. Physiol. 282: L833–L839.
. 2011. 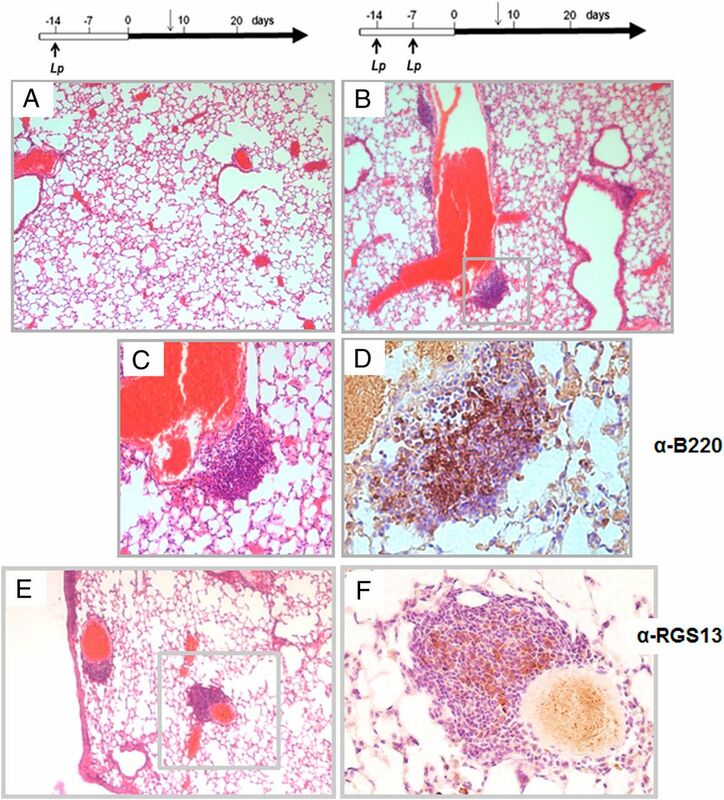 Canine pneumovirus replicates in mouse lung tissue and elicits inflammatory pathology. Virology 416: 26–31.
. 2008. RGS13 acts as a nuclear repressor of CREB. Mol. Cell 31: 660–670.
. 1992. The role of BCG/PPD-activated macrophages in resistance against systemic candidiasis in mice. Scand. J. Immunol. 36: 713–719.
. 2012. Bacille Calmette-Guérin induces NOD2-dependent nonspecific protection from reinfection via epigenetic reprogramming of monocytes. Proc. Natl. Acad. Sci. USA 109: 17537–17542.
. 2011. Synergistic interactions of TLR2/6 and TLR9 induce a high level of resistance to lung infection in mice. J. Immunol. 186: 5916–5926.
. 2008. Stimulation of lung innate immunity protects against lethal pneumococcal pneumonia in mice. Am. J. Respir. Crit. Care Med. 177: 1322–1330.
. 2009. Augmented lung inflammation protects against influenza A pneumonia. PLoS ONE 4: e4176.
. 2014. Lung epithelial cells are essential effectors of inducible resistance to pneumonia. Mucosal Immunol. 7: 78–88.
. 2013. Lactobacillus fermentum CJL-112 protects mice against influenza virus infection by activating T-helper 1 and eliciting a protective immune response. Int. Immunopharmacol. 18: 50–54.
. 2012. Intranasal administration of live Lactobacillus species facilitates protection against influenza virus infection in mice. Antiviral Res. 93: 138–143.
. 2011. Oral administration of heat-killed Lactobacillus pentosus strain b240 augments protection against influenza virus infection in mice. Int. Immunopharmacol. 11: 199–203.
. 2014. Oral administration of Lactobacillus brevis KB290 to mice alleviates clinical symptoms following influenza infection. Lett. Appl. Microbiol. 58: 87–93.
. 2013. Anti-influenza virus effects of both live and non-live Lactobacillus acidophilus L-92 accompanied by the activation of innate immunity. Br. J. Nutr. 110: 1810–1818.
. 2008. Dual role of B-1a cells in immunity to influenza virus infection. J. Exp. Med. 205: 3053–3064.
. 2007. Natural antibody and complement mediate neutralization of influenza virus in the absence of prior immunity. J. Virol. 81: 3487–3494.
. 2002. RGS13 regulates germinal center B lymphocytes responsiveness to CXC chemokine ligand (CXCL)12 and CXCL13. J. Immunol. 169: 2507–2515.